Pennsylvania Gov. 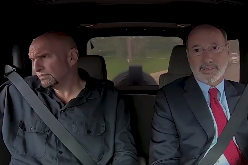 Tom Wolf and running mate John Fetterman pay homage to "It's Always Sunny in Philadelphia" in campaign ad for gubernatorial election. Braddock Mayor John Fetterman has always been characterized as unconventional candidate: The tattooed Harvard grad and middle-class champion who might as well be Pennsylvania's own Incredible Hulk. When that sense of novelty becomes your selling point, you might as well take it to the bank—or maybe the Jos. A. Bank, or something. Less than a month after defeating embattled Lt. Governor Mike Stack in the Democratic primary election, Fetterman is already campaigning alongside incumbent Gov. Tom Wolf, who appears on track to face Republican challenger Scott Wagner in November's gubernatorial election. They're off to a brilliant start. Governor Wolf released a campaign ad on Wednesday afternoon that shrewdly riffs on the long-running FXX series, "It's Always Sunny in Philadelphia." For all his wit and charm, Fetterman was in dire need of a neck tie. A recent poll from Franklin & Marshall College found that Wolf held leads of at least 17 percent over all three potential Republican candidates in November's election.